The Bermuda National Trust will welcome about 100 delegates from around the world later this month for the International Conference of National Trusts, an event helping to shine fresh light on the island’s cultural assets and how they can be used to stimulate new, revenue-generating opportunities in tourism. The Bermuda Tourism Authority said they welcome the refocused exposure, having created a cultural tourism strategic plan in 2018 and woven its findings into the National Tourism Plan. Last week Heritage Bermuda, a consortium of heritage and culture organisations, met with the Bermuda Tourism Authority to prioritise which opportunities to collaborate on and aggressively pursue. “A strategic approach that focuses more on collaboration over competition is a key action item of the National Tourism Plan. We hope to see all of our cultural tourism partners thinking more cohesively,” said the BTA’s Director of Strategy and Corporate Communications Glenn Jones. Last year’s cultural tourism plan, that ultimately fed into the National Tourism Plan, identified 200 cultural sites, museums and annual events across the island. Heritage Bermuda and the Bermuda Tourism Authority are now collaborating on ways to reimagine what already exists and package it for visitors in a way that is easy-to-access and bookable online. “Heritage Bermuda is encouraged and excited by the developing collaboration between our nine members and the Bermuda Tourism Authority,” said Richard Spurling, the group’s chairman. “At a recent meeting, at which all members were present, the cultural tourism strategy was explored by the group and three areas of focus were agreed. Heritage Bermuda believes that if we all work together we can achieve a better cultural tourism experience and better value for money for our visitors. This biennial International Conference of National Trusts takes place March 27 to 30; the Caribbean Conference of National Trusts will happen simultaneously. About 37 countries in all will be represented. Meantime, the Bermuda Tourism Authority is also working with the African Diaspora Heritage Trail Foundation to shape new cultural tourism experiences around Bermuda’s African Diaspora Heritage Trail [ADHT]. A team from the BTA and its Visitor Services Centres toured ADHT sites recently with Titan Express. 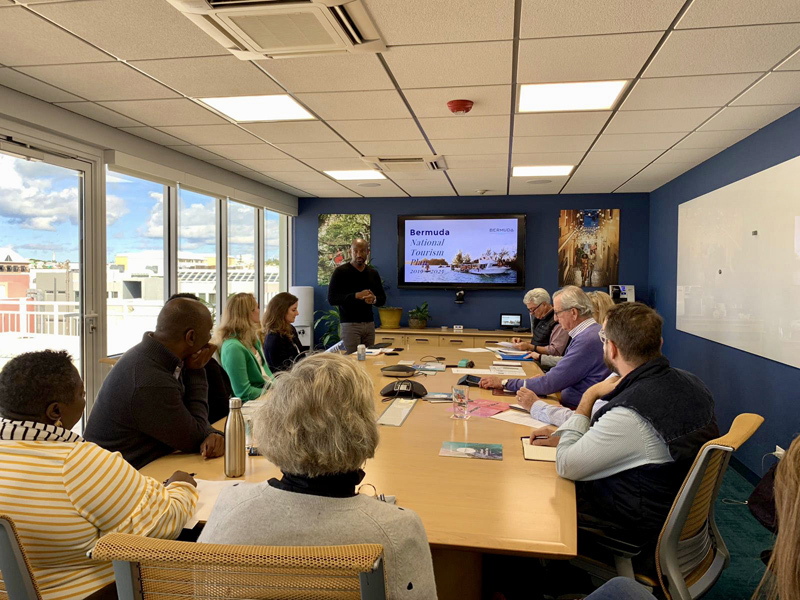 The work with Heritage Bermuda and the ADHT Foundation are important building blocks toward making the destination more attractive for group travel, something the BTA’s sales team is eyeing closely. 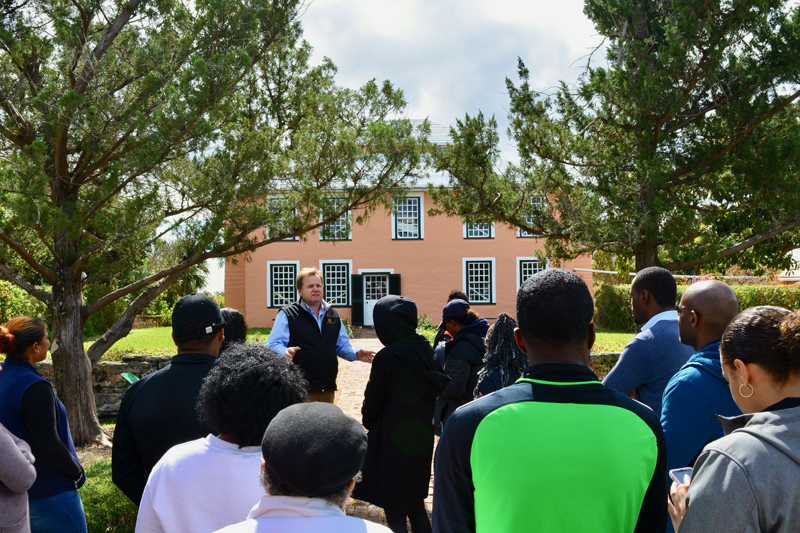 Simon Boden, the BTA’s Director of Sales said: “In addition to working with the Bermuda National Trust for next week’s conference, our team worked on the Educational Travel Consortium last year and is working now with new groups for 2019, including a state botanical group from the U.S. looking to experience Bermudian homes, gardens and architecture. Sorry to inform you but your average visitor does not care much for cultural tourism. Back in the days when we still had a somewhat healthy air visitor number I provided a service catering to what I considered to be the cream or the tourism crop. These were the people who stayed in the most expensive of the accommodation we had at the time. Places like Horizons, Pink Beach Hotel, Lantana. All gone. I did not offer a canned commentary as necessary on glass bottom boat tour. What was offered was conversation driven. Lots of questions. Lots of answers. After the usual Bermuda Triangle, where to eat, where else to stay on a return, which beach, population size & make up, type questions the conversation would usually revolve around living here. Questions about grocery prices, gas prices, vehicle prices, property tax, our tax system, political system, health care etc. Things that they could relate to. All kinds of things but seldom anything cultural unless I could tie in US history with our own. Gombeys, if they had been seen, are viewed as a novelty good for a couple minutes of entertainment. They do ask about ‘island’ music & where it can be experienced. No, reggae is not island music to them though a limited dose of it is fine. Much depended on the line of work the client was in & their education level. Those with not much more than a basic education tend not to have much interest beyond their own lives. There are exceptions of course. I am a firm believer in giving the customer what they want, not trying to shove what we want to give them in their faces. Cultural tourism is nice, for the few interested, but sorry to say it is not of interest to the vast majority. Tourist are now very much interested in Cultural tourism. Sit ya old @$$ down buh lol…you’re still in the past!